In a previous post, I described my trip on Amtrak from Ft. Worth to St. Louis – I guess you could call it a birthday present to myself. I had two reasons for choosing St. Louis as the destination. For one, it was the farthest point I could get to and still have enough free miles to get back home again (that’s important!). But beyond that, St. Louis is home to one of the finest collections of railroad equipment anywhere in the country, at the St. Louis Museum of Transportation. From the downtown Amtrak station, I caught another Amtrak train, the Missouri River Runner, to the suburb of Kirkwood. From there, it was just a short Uber ride to the museum. It was lightly raining off and on throughout the morning, but not enough to dampen my plans. A guided tour had just started when I arrived, but I was able to catch up with the volunteer and the handful of guests he was leading, and we began walking the grounds of the museum. We took advantage of a break in the rain to tour some of the exhibits that were out in the open, including a collection of unusual freight cars, a caboose or two, and a Texas & Pacific baggage car that has been converted into a classroom on wheels for school groups. We also saw a beautiful, side by side display of three locomotives, headlined by a rare, stainless steel Burlington engine, the “Silver Charger,” #9908. This unusual diesel-electric was built by EMD in 1939 to pull the “General Pershing Zephyr” between St. Louis and Kansas City, and was the last of the “shovel nose” units in service. A Frisco RR 2-10-0 steam locomotive and an early diesel switcher from the Sabine River & Northern sat beside the shiny passenger engine. Under their sprawling pavilion, the museum has a nice assortment of passenger equipment, locomotives and more, including a number of rare and one-of-a-kind items. One of the things I especially enjoy about passenger trains from the 1950s and 60s were all the bright colors, and the museum does not disappoint, with the blue and cream of the Missouri Pacific’s “Eagle,” the two-tone light and dark greens of the Northern Pacific, the shiny silver of the Burlington, the maroon and red of the Gulf, Mobile & Ohio, and more, all proudly on display. Scattered throughout the museum grounds are numerous other items of significance to any railfan, including a brown & yellow GM Demonstrator locomotive from 1939, part of the famous “Train of Tomorrow” that toured the country in the 1940s. The famous Frisco locomotive #1522 is there, along with a UP 4-8-8-4 “Big Boy,” an enormous “Centennial” diesel, and much, MUCH, more, including an extremely rare “Aerotrain,” a futuristic train that looks like some- thing out of a science fiction movie, but actually saw service in the 50s and 60s on the Rock Island and other railroads. Time was beginning to get away from me, and I had more that I wanted to do before my train back to Texas left, so I caught a return ride on Amtrak to downtown. I went up to the top of the St. Louis Arch, saw venerable Busch Stadium (home of the Cardinals), and toured the famous (and historic) St. Louis Union Station (no longer used by Amtrak), built in 1904 for that year’s World’s Fair, as celebrated in the Judy Garland musical, “Meet Me in St. Louis.” I also had a fine seafood dinner before making my way back to the Amtrak station. The southbound Texas Eagle was on time, and I boarded and found my way to my room. I deposited my gear and headed for the dining car, just in time for dessert and coffee. From there, I went back to my room and slipped between the sheets and was soon asleep, rocked by the gentle rhythm of the rails. Epilogue: When I woke up the next morning, I wasn’t exactly sure where we were until I looked out the window. Even in the foggy, gray, half-light of that early fall dawn, I knew we were in Marshall, Texas, because right outside my window I saw the steam locomotive Texas & Pacific #400, which is parked beside the historic Marshall depot. I showered and dressed and headed for breakfast. Even though this train ride wasn’t yet over, I was already thinking about where I could go on my next #AmtrakAdventure. First, the obvious – I like trains. I like riding on them, watching them, and reading about them. When I can’t do any of those things, I enjoy the hobby of model railroading. One of the great things about Christmas is that it’s the one time of the year when “playing with trains” is considered cool, rather than quirky. So the following piece is one of my favorites. “The Train” is a dramatic reading by the late actor Geoffrey Lewis, performed with the musical and storytelling group, “Celestial Navigations.” I first heard it a few years ago on a local radio station, who had it in their Christmas music mix. I don’t think it’s too well known, so I wanted to share it with you and hope you will enjoy it. You can buy a copy of it here, or see the YouTube video here. There was hardly anyone on the train, as it moved through the countryside. The snow-covered land slipped smoothly by. Way out there I could see a lonely house now and again, just turning on their lights against the cold, oncoming night. Two thick-coated horses in the almost-dark, steam coming out of their nostrils, eating hay, then they were gone. The sky was quickly dark; the stars were crisp through the chill air. Wasn’t very warm on the train. A man was asleep at the other end of the car, his coat rolled up for a pillow and a Christmas present had fallen on the floor. A few seats away a young woman sat with her baby. She was staring out the window. She saw me looking at her, reflected in the window, and she half-smiled at my reflection and she stared beyond that out into the cold dark landscape that was slipping away. I turned and gazed back out my window, and then I heard a very soft, “Ohhh.” I turned and looked at the woman and I saw her hug her baby to her, very closely and very intently. Suddenly I felt very close, very close and warm, and a door appeared in the back of my mind. I opened it and light flooded in and I heard my father say, “Burrrr, burrrr, it’s cold outside. You can put those logs right on the fire,” and as I stepped in, he shut the door behind me. I was standing in my living room; the Christmas tree was all lit up over by the front windows. I heard laughter upstairs, my mother came through the swinging kitchen door carrying a plate of red and green frosted cookies, and behind her came the smell of roasting turkey like a gauze that draped around my head, like the smell of earth that hangs out in the ocean and lets you know home is just over the horizon. Someone was stamping snow off their boots on the back porch and my little sister and two of her cousins were lying on their stomachs in front of the tree, starring at the presents like sharks at a man’s legs under water, hoping to see beyond the tinsel and pretty paper. I put the logs down and took off my gloves to warm my frozen fingers. In the dining room my grandma was scolding my grandpa about the best way for him to crack the walnuts that he was already cracking. He looked at me through the doorway and shrugged his shoulders and continued shelling the walnuts. I took off my thick coat and threw it on the floor by the door and went to stand by my aunt who had just called me to come sing the tenor part at the piano. There was talk and loud laughter coming out of the kitchen where the windows were steamed. We were singing, sometimes forgetting the second verses, but sounding pretty good. The train slipped away across the sleeping land, into the dark winter night. Anyone who knows me well knows that I love trains. Real trains, model trains, amusement park trains – doesn’t matter. If it runs on rails, I want to see it, watch it, and ride it if I can. I also happen to be a fan of history. I am fascinated by the past, by the forces that shaped our society and by the decisions that brought us to where we are today. I’m glad that some railroads are recognizing and honoring their history and their heritage, but it’s not just about trains. There is history worth hearing, all around us, in the neighborhoods where we live, and along the streets where we drive. Grandparents who can teach us, elders who can inspire us, and old buildings that can help us remember the struggles of the past. Learning about the past doesn’t have to be boring. It’s a shame that so many history classes are being led by teachers who think that history is all about dates on a calendar. Truly, they are missing the point. History – real history – is about people and their stories. Spend some time getting to know the older people on your block, or at your church. They have stories to tell. Another idea? If you’re in Abilene, go to the library and check out any of the fascinating series of DVDs produced by a GOOD history teacher, Abilene’s own Jay Moore, “History in Plain Sight.” You might want to start with his video, “Who is That Street?” It tells the story of the early settlers who came to Abilene, braved incredible hardships, and carved out a living for themselves and their families – and now we remember them by the streets we drive on. They are stories worth hearing. Understanding something of our past reminds us that someone came before us and dreamed a dream, and we are the heirs of that legacy. It keeps us humble to realize that we are enjoying the fruits of someone else’s labor, and it inspires us to work for those who will come after us – to leave something better for our children and our grandchildren. Holding on to our heritage helps us know who we are, where we’ve been, and where we are going. Remembering the past gives us hope for the future. I am just back from taking a couple of weeks off. During that time, I was able to visit some family, help my dad with some chores, get some reading done, ride a train, and eat some Cajun food. I was gone for a few days, and came home broke and tired. That’s how you know it was a good trip, right? No, I’m just kidding about that part – but it WAS a good trip. The main reason I went was to go down to the Beaumont / Orange area to see my 85-year-old dad and spend some time with him. And we did have a really nice visit, and I was able to help him with some things around the house. But I also enjoyed spending some time with my brother David. He’s a pastor in Spring, Texas, and was also on vacation. He and I had often talked about trains and taking a trip together on Amtrak, so we did just that – not so much to go anywhere, but more just for the experience of riding a passenger train together. We boarded the eastbound “Sunset Limited” in Houston, and toot toot, we were gone, headed for Lake Charles, Louisiana. Now as my friends can tell you, I love trains, but as great as that part of it was, an even better part was getting to spend time with my youngest brother. We grew up in a family of four boys – he and I are the bookends, with me as the oldest and him as the youngest. Our mom’s parents lived in the small Hardin County town of Grayburg, between Beaumont and Houston. The old Missouri Pacific RR main line runs right through there, and when we were kids visiting our grandparents, we used to spend hours down by the tracks at a small railroad side track where they used to load freshly-cut pine logs onto flatcars, destined to be turned into paper at one of the mills in East Texas. How we loved to see freight trains coming through! The big blue and white MP engines, the long trains, and the red caboose at the end. The box cars with names of faraway places – Bangor and Aroostook, Atlantic Coast Line, and the New York Central, Great Northern, Santa Fe, Denver & Rio Grande, and the Illinois Central, just to name a few. And when they came roaring through, it was all noise and power, sound and fury, speed and excitement. We knew to get well off the tracks and wave from a safe distance. And as Johnny Cash once observed, it was always very important that the conductor in the caboose waved back. Somewhere I still have some flattened pennies that we made. And the smells on those hot afternoons – the oily odor of the creosote from the ties, and the zingy smell of hot steel in the Texas sun. We would walk along the rails and practice our balancing skills and watch the distant signal lights, hoping they would turn red, heralding the approach of another train. Anyway, our grandparents have long since passed away, but the little town is still there, and so are the freight trains, now operated by Union Pacific. 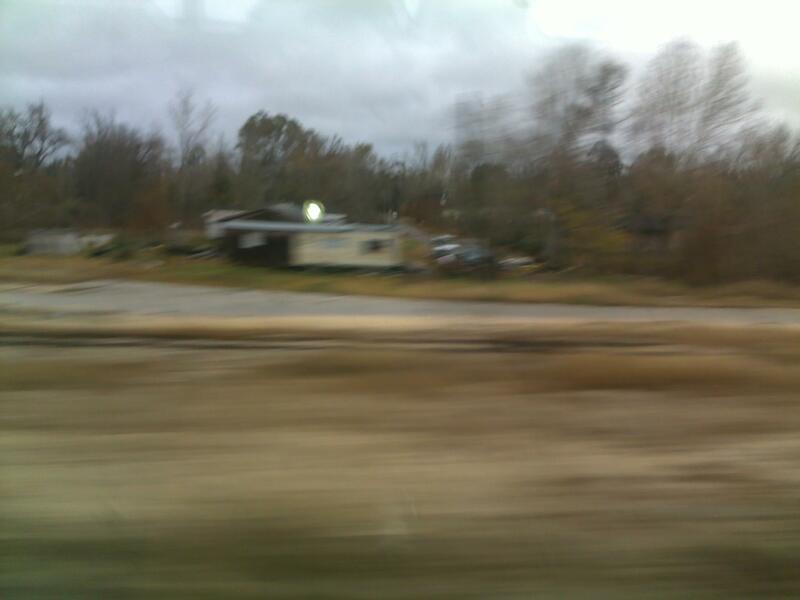 And when you take Amtrak heading east towards Beaumont, you go roaring right through there. So we climbed aboard in downtown Houston, checked in with the conductor, and headed for the dining car and lunch. We both had a pretty good Angus beef hamburger, and enjoyed a nice visit with an older lady and her niece who were returning to Florida after a trip to California. After lunch, we walked to the observation car as the train rolled through the countryside and past the little towns. The old siding at Grayburg is still there, and it doesn’t take long to go past it. I looked over, and my brother was wiping away a tear. I asked him what he was thinking. He said he thought he saw four little boys run over to the tracks after the train went by, looking for flattened pennies. As a railfan, I’ve often wondered what it would have been like to live in the old days, the so-called “Golden Age of Rail Travel” of the 1920s through the 1940s, when you could get on a train at a station in just about any town, no matter how small, and it would take just about anywhere you wanted to go. The train was literally your gateway to the world. 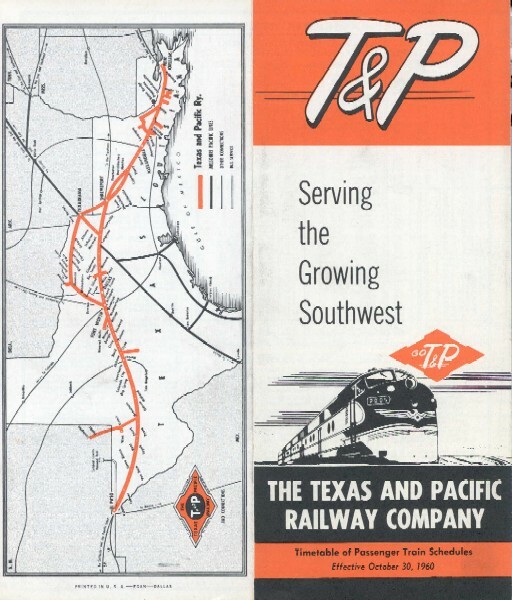 The first leg of the tr ip was on the Denton County Transportation Authority’s “A-Train.” Now, just saying that makes me think of the classic Big Band-era tune, “Take the A-Train,” which I suppose is what their marketing people were going for when they picked that name. (You can listen to the song through the player at the bottom of this page.) 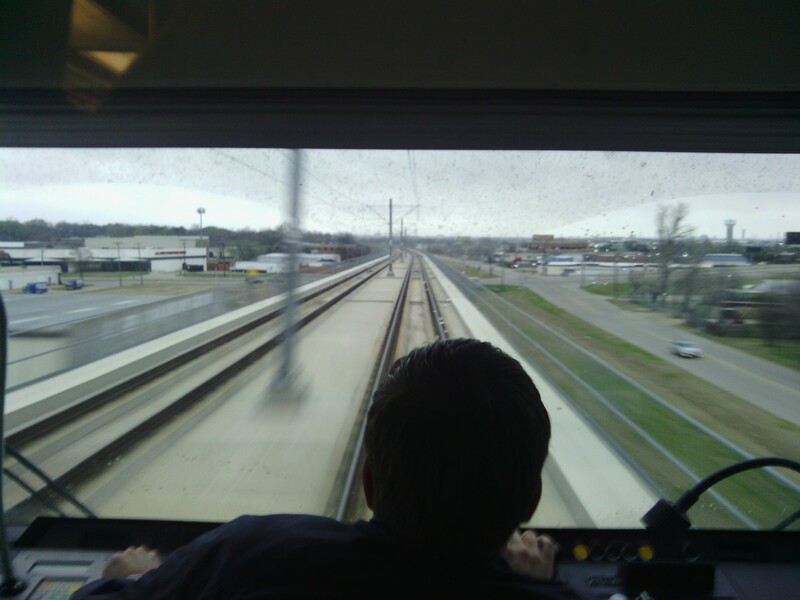 The line is built on the old M-K-T (Katy) corridor, and runs from downtown Denton to Lewisville, then to Carrollton. I bought my ticket from one of the vending machines on the platform and sat down to wait. I’m happy to report these trains run on time. When I rode the A-Train in December, 2011, they were still using refurbished 50-year-old Budd RDC coaches they had leased from the Trinity Railway Express (TRE). 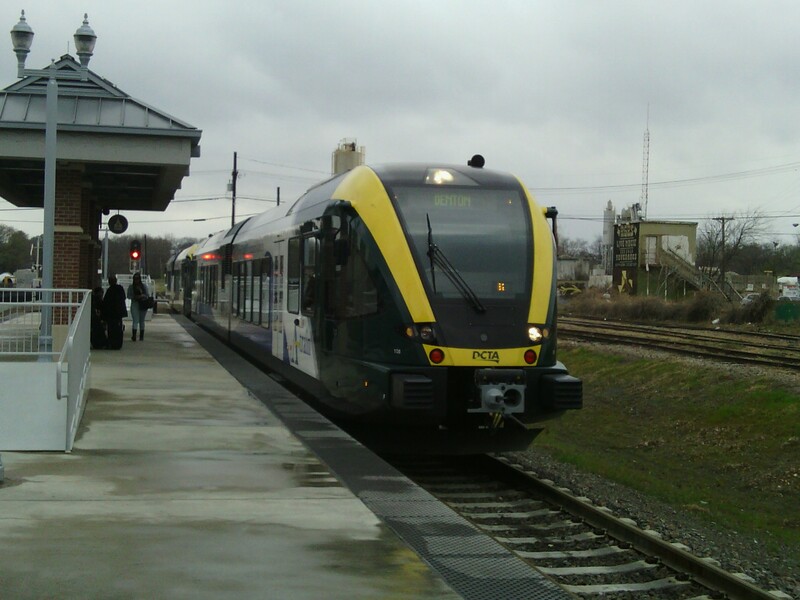 This time, though, they had brand new equipment built by Stadler Rail of Switzerland – they’re also the manufacturer of choice for Capitol Metro in Austin. Very modern, very clean, very quiet. Also very comfortable. The engineer gave the traditional signal that the train is about to move – 2 short blasts from the horn. So, as my friend Joe Calvert (himself a retired railroad man) used to say, “Toot-toot and gone.” These modern trains are very quiet, and acceleration and braking are both quick and smooth. We were up to speed in no time. It’s interesting, the things you see while riding a train. For example, we’re used to sitting at crossings in our cars, watching trains go by. It’s a different thing to be in the train going by, and look out at the drivers, sitting there waiting for you to go by. Another thing: the strange, almost voyeuristic feeling of looking over into people’s backyards. You know, most people keep their front yard neat, to keep up appearances for their neighbors, if nothing else – but backyards, it seems, as a different matter. We arrived at the Trinity Mills station – the end of the line for the A-Train. I stepped out to wait for the DART train – Dallas Area Rapid Transit – that would take me to downtown Dallas. Those trains also run on time, and it arrived in 3 minutes. The all-region ticket I had bought earlier was good for all trains, all day, and I stepped aboard. 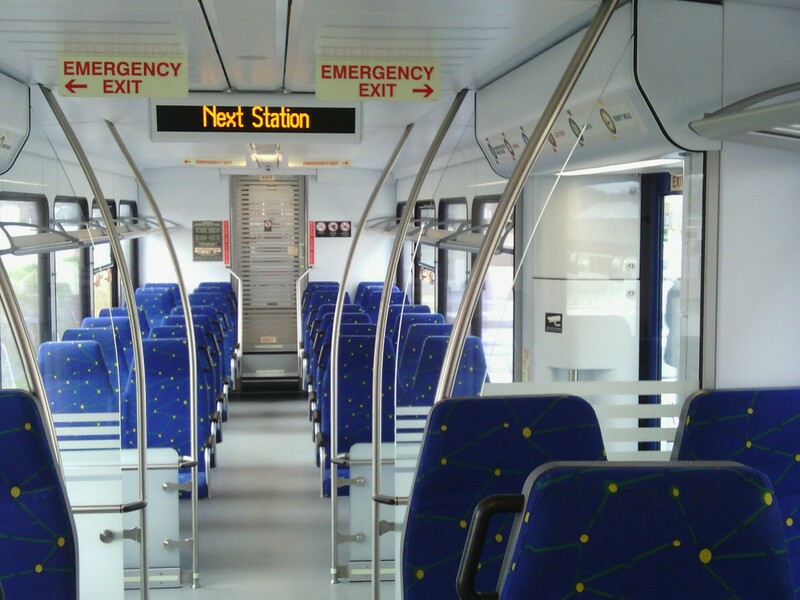 Unlike the so-called “heavy rail” equipment of the A-Train, DART trains are “light rail.” That’s a bit of a misnomer – it’s the equipment that is light or heavy, not the rails. DART trains are electric, drawing their power from the catenary wires overhead. 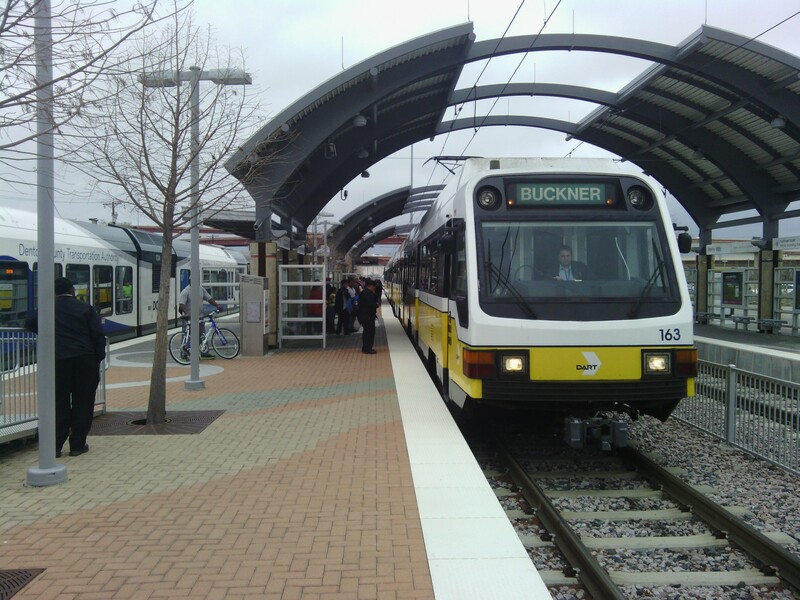 If you haven’t ridden a DART train, you really should try it the next time you have to go anywhere near downtown Dallas – they are amazingly clean and convenient. You don’t have to worry about traffic, and there’s no hassles or expenses for parking. Wanna go to the Dallas Zoo? Take the Red Line. Need to visit the VA hospital? You want the Blue Line. So here I was on the Green Line, which runs through Carrollton and Farmers Branch, south past Love Field, and on towards downtown and then to Fair Park. This picture is looking east along Valley View Drive in Farmers Branch. See that little building on the corner where the white truck is parked? I think it’s a Chinese restaurant now, but it used to be a little diner called “Mr. 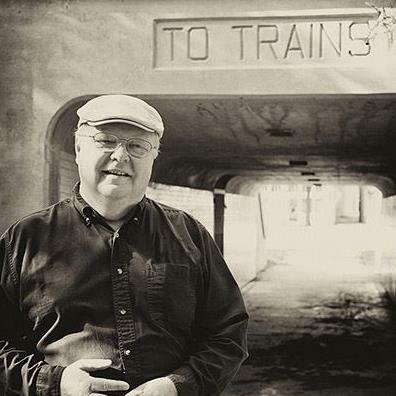 Hilton’s Railroad Crossing.” I working there as a short-order cook in 1978, the summer Kathy and I got married. As we continue south, part of the time the line runs at ground level, part of the time on elevated tracks, part of the time under ground. But always, fast. In a few minutes we were approaching the American Airline Center downtown and DART’s Victory Station, where I again would change trains. Once again I was REALLY glad the trains ran on time, because as we pulled into the station, there sat the westbound Trinity Railway Express, which would take me to Ft. Worth. I stepped off DART, walked across the platform, and stepped onto the TRE. The doors closed, and toot-toot, we were gone. 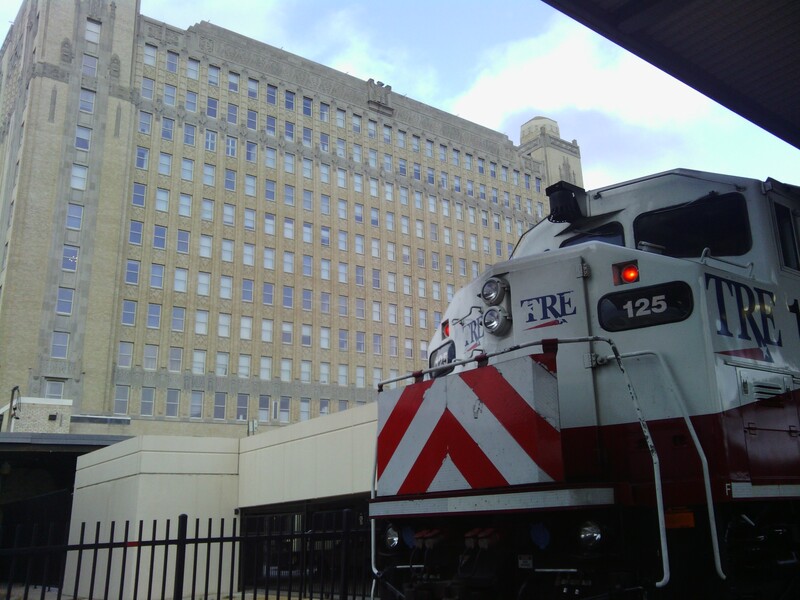 The TRE has been operating since 1996 along the old Rock Island corridor between Dallas and Ft. Worth, and is quite a success story, with annual ridership of over 2.5 million passengers. I first rode it about 2001, when I took it to Dallas Union Station, to attend a Promise Keepers rally at the old Reunion Arena. 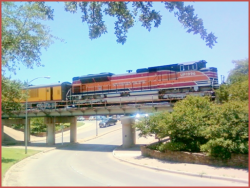 They operate numerous trains between downtown Dallas and downtown Ft. Worth, daily except Sunday, with intermediate stops in Irving, D/FW Airport, Hurst and Richland Hills. 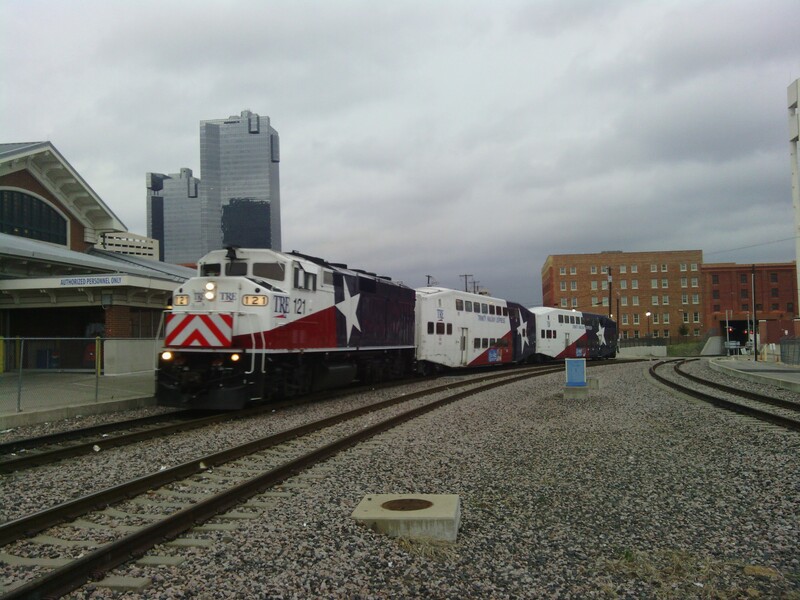 The train also stops at the Ft. Worth Intermodal Transit Center where you can connect with Amtrak intercity trains, Greyhound Bus Lines, and The-T, Ft. Worth’s city bus service. 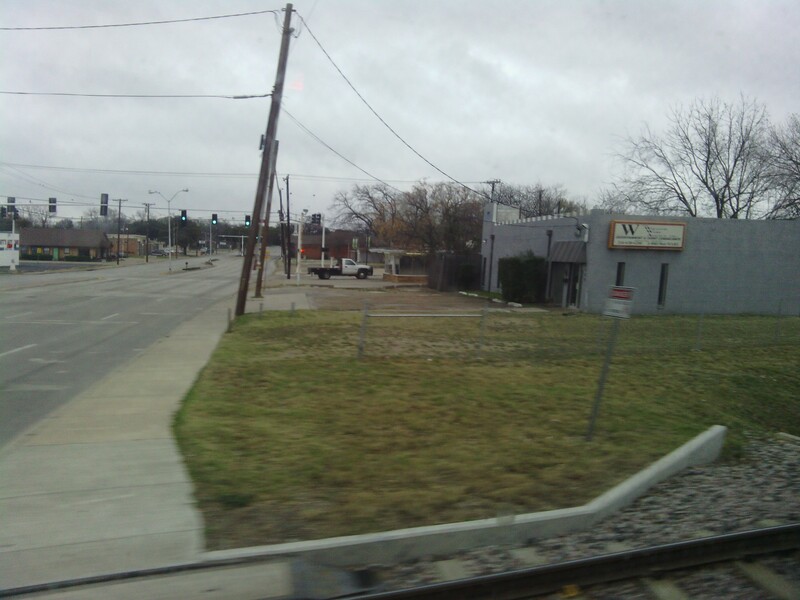 The TRE’s western terminus is the old T&P train station, on the southern edge of Downtown Cowtown. This old building is an Art Deco palace, and has been given new life in recent years, and turned into a high-rise complex of luxury condos. 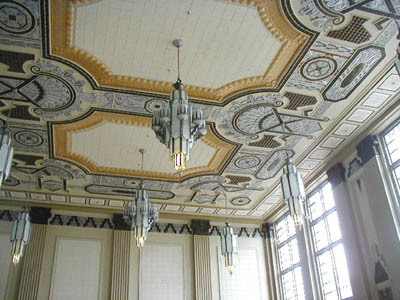 The building has these cathedral-like ceilings, with intricate masonry, tile and burnished aluminum. The chandeliers in the lobby have to be seen to be believed – it’s easy to see why it’s become a popular spot for wedding receptions. 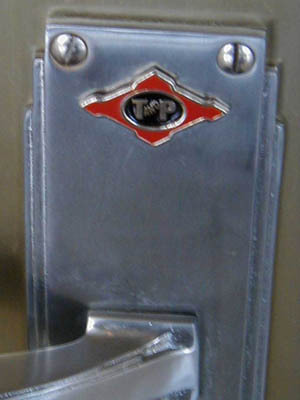 The diamond-shaped T&P logo can be seen everywhere – even in the door handles. 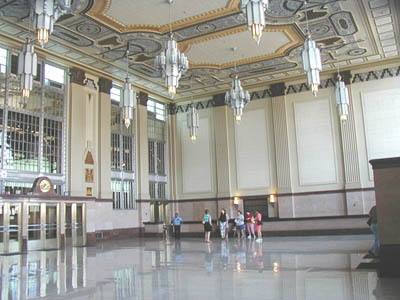 Standing in that lobby, it’s easy to imagine that you are a traveler from the 1930s, arriving to board the train. 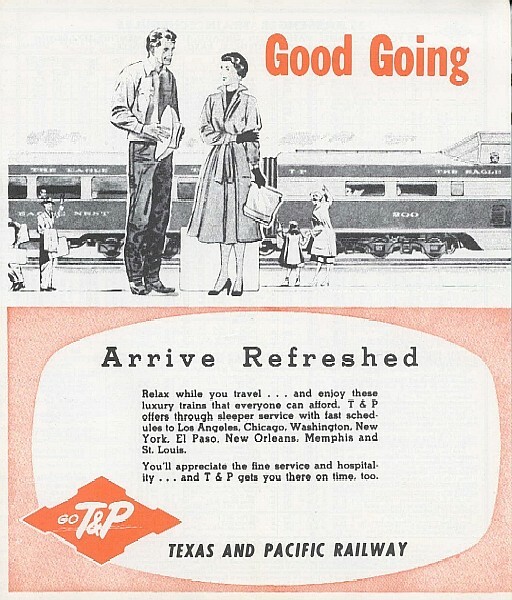 Maybe you’re heading west, taking the T&P to El Paso, and changing trains to go on to Los Angeles. Or maybe you’re heading to Chicago, or New York. They’re all just down the hall. Another cool thing here – the T&P Tavern. This is the refurbished cafe-lounge area adjacent to the main waiting room in the station. 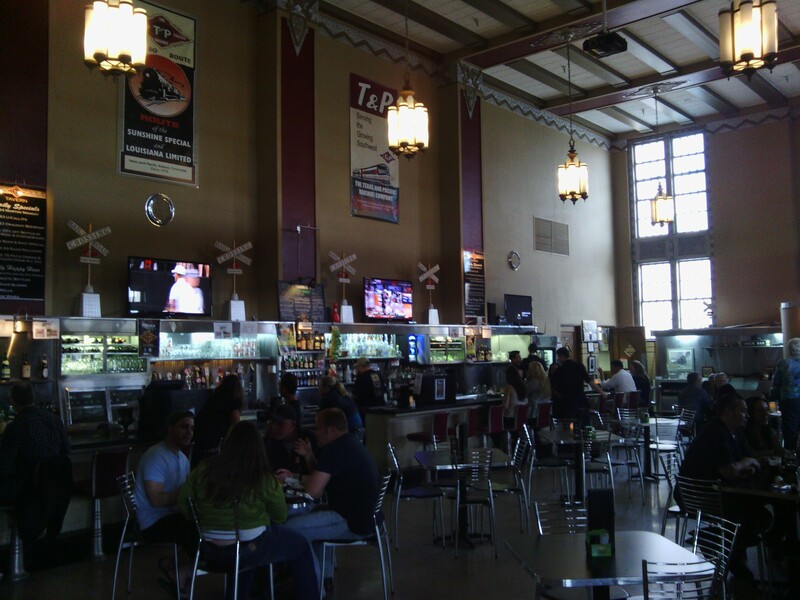 It’s a fun and funky little place with some really cool railroad memorabilia, giant travel posters on the wall, good food, and a nice selection of craft beers. It’s easy to imagine travelers from the past, sitting there, enjoying a meal or a drink while waiting for their train. I sat at the bar and sipped a glass of rye whiskey and felt very connected to the past. 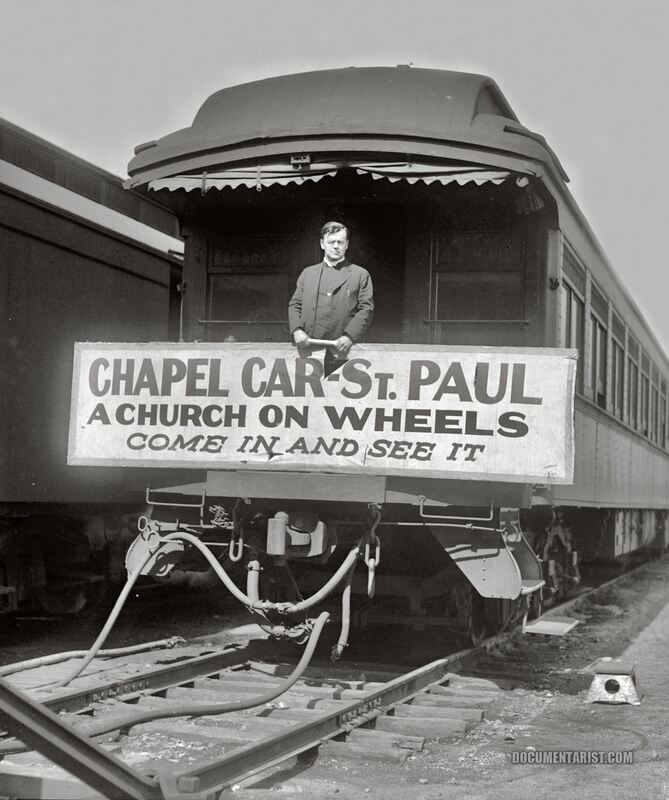 Ever heard of a chapel car? Well, neither had I, at least not until I was lurking in the basement of the Abilene Public Library recently, browsing through their railroad section, and I came across a book entitled, This Train is Bound for Glory. 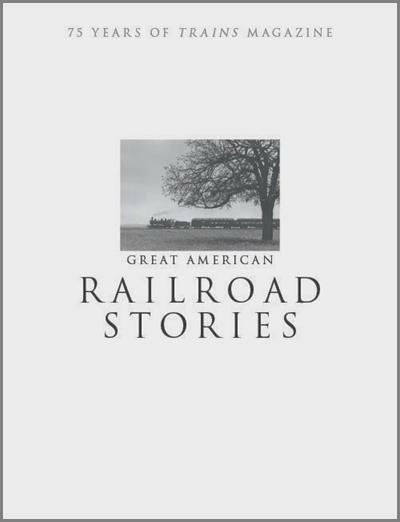 The book tells the story of a fleet of special-purpose railroad cars that were essentially church buildings on wheels. But there were many who wanted more than just a chance to make a fast buck: they were looking for a place to put down roots, get married, raise a family and build a home. Some came from “back east,” looking to start over. Some came from overseas, from Ireland and Italy, from Bohemia and Norway and Poland. All of them knew that having a church in their community was essential. 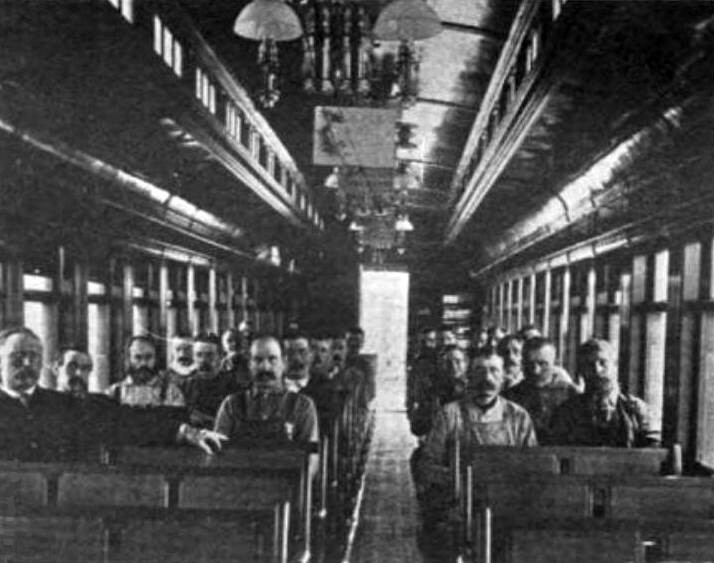 And so the chapel car was invented, and over the next few years, 13 were built – seven for the Baptists, three for the Episcopalians, and three for the Catholics. They were in operation primarily in the Western U.S. between about 1890 and 1940. Each of the cars was a little different, but they were all built along the same idea. Most of the car was a church building on wheels, with seating for 50-80 people, a small lectern, and an old-style Estey pump organ. The rest of the car was a small private area where the missionary and his wife would live, and it included drop-down beds that were mounted on the wall, a small kitchen/living space, a water closet/toilet, and a tiny office/study area. The railroads were big supporters of the concept, and for many years, provided free hauling and parking services for the cars, as well as free or reduced-cost maintenance. 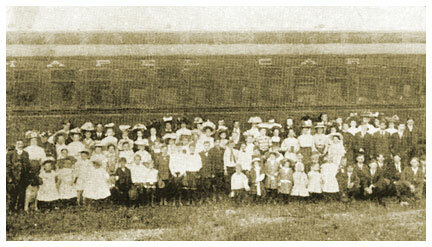 Some of the railroads helped the chapel cars because the rail owners were believers, and wanted to see the gospel advance. Others supported them because they wanted to reduce alcoholism and violence among the rail workers, and saw the church as a great “civilizing influence.” Whatever. The usual pattern was for the railroad to pull the car into a town and park it on a convenient siding. Sometimes it was parked in or near the railroad’s shops and offices, for the convenience of the people working there to attend services. Often, it would be parked in proximity to the town’s “red light” district, to counter the influence of the whiskey and women that could be found there. The missionaries who served on board these rolling churches had to have a special calling. The men had to be willing to be open and welcoming to railroad men and others who would come to services on their lunch or dinner breaks, filthy from work. They had to be willing to visit the saloons and dance halls and hand out gospel tracts and Bibles to the “soiled doves” who worked there. They had to be people without judgmentalism, and willing to talk to everyone. And they had to be tireless: most of the time, they would hold services twice a day, at noon and again at midnight, for the men working the various shifts. Their wives had to have a calling of their own. It was expected that they would play the organ and sing, hold Bible classes for the children of the town in the morning, and help their husbands counsel with the prostitutes and others who visited the car. They had to try and make a home in a cramped, tiny space that was brutally hot in the summer and bitterly cold in the winter. And they had to put up with the noise, the soot, and the constant banging and shuffling of cars that was part of life in a railyard. It was not an easy assignment. 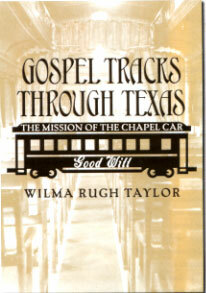 In her book Gospel Tracks Through Texas, author Wilma Rugh Taylor tells the story of Chapel Car #4, named “Good Will,” which served many years all across Texas. It was owned by the American Baptist Publication Society, based in Philadelphia. But there was a problem. Most Texas Baptists were affiliated with the Southern Baptist Convention, and were very suspicious of the “northerners” building these cars. In spite of initial misgivings, though, most of the towns where the chapel cars served eventually welcomed them with open arms, and were won over by the dedication and hard work of those who served on board. The author, Mrs. Taylor, has shown some dedication herself. 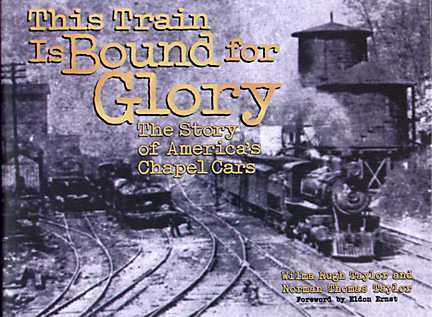 She and her husband, the late Norman Taylor, also wrote the previously mentioned This Train is Bound for Glory, based on literally years of painstaking research and traveling across the country to document the nearly-forgotten story of the chapel cars. Tragically, he died from a fall in 2007, when he was working to help restore one of the cars. If you would like more information about the chapel cars, Mrs. Taylor has a website, chapelcars.com, that has all the details and floor plans. My wife says it would have been my dream job, just a hundred years too late. And I have to admit, there is some truth to that. On the other hand, I like the concept of using whatever tools are available to reach out to the marginalized and forgotten. Mrs. Taylor tells several stories of the missionaries intentionally working among the newly-arrived immigrants who didn’t speak the language, as well as the town drunks, the dance hall girls, and others “written off” by polite society. 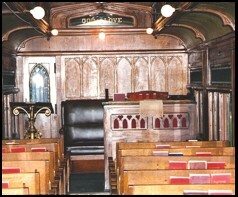 At the front of the partition of the chapel car was a glass transom with the message, “God is Love” carefully written across it in gold leaf. It’s a message that was not lost on the thousands of lives touched by the chapel cars and those who served on board. They could read it in the Bibles they were given, they could hear it in the messages that were preached, and they could see it in the lives that were lived out in front of them. It’s a message that is still worth sharing – and living – today. As I have often mentioned, I love trains. It’s something that has been in my blood since I was a kid, watching trains go by my grandparent’s home in Grayburg, Texas – near Beaumont on the Missouri Pacific main line between New Orleans and Houston. I’ve known several men who worked for various railroads, and many of them don’t understand the attraction for railfans. To them, it’s a job – period. But to me, and other lovers of all things rail-related, it’s a passion. So it should come as no surprise that part of the hobby I enjoy is collecting railroad memorabilia, or as it is sometimes called, railroadiana. Like any form of collecting, there are different ways to enjoy this hobby. Some collectors get all they can of certain items, from whatever railroad – dining car china, for example, or timetables. Others collect items from certain railroads, and that’s where I fall into this obsession. 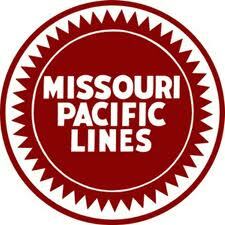 My chosen lines are the Texas & Pacific and its corporate big brother, the Missouri Pacific. I mean, if I can’t own the railroad, I can at least own a few pieces of it, right? So here are a few things that I have gathered over the years. And in case you’re wondering, no, none of them are terribly valuable – otherwise, I would never have been able to acquire them in the first place! Timetables are a fairly common collectible. They’re not large or bulky, and relatively easy to store. And, they were produced in such large quantities, that even decades later, you can still find them at reasonable prices, unless you’re trying to find some really obscure ones or something. 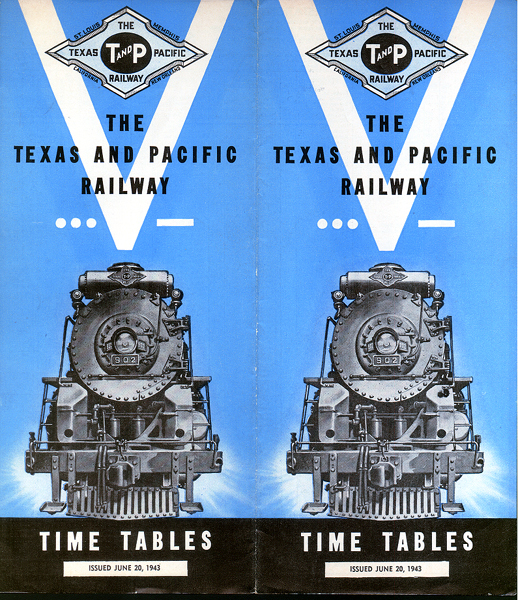 This is one of my favorite T&P timetables – it’s from 1943. Notice the big “V” for victory – also the three dots and a dash – Morse Code for the letter “v.” Three shorts and a long – it’s why the opening of Beethoven’s Fifth Symphony was used by the BBC during the war, as theme music for their newscasts. Here’s another favorite. This timetable was given to me many years ago by Mrs. Mildred Green, a member of the Christian Church in Haskell where I was pastoring. Her late husband had worked for the Roscoe, Snyder and Pacific Railroad (you gotta love the ambition of that name! 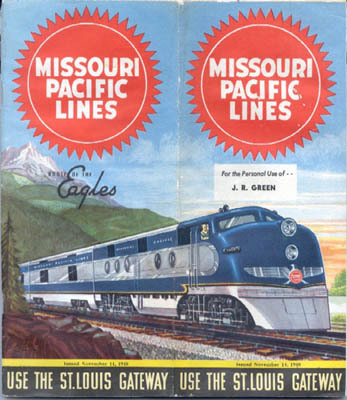 ), and he received this timetable from the Missouri Pacific because of those connections – his name was even printed right there on the cover. The inside cover is also shown. Some of the most popular railroad items to collect come from the dining and lounge cars. Eating a meal on the train has always been one of the great treats of rail travel – still is today, for that matter. 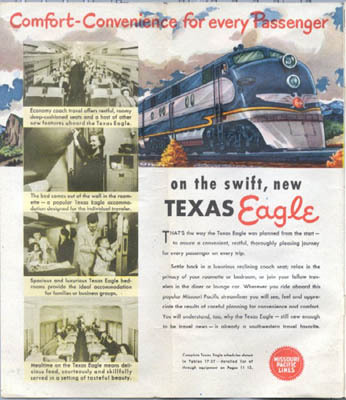 Back in the so-called “Golden Age” of passenger travel – the 1920s – the elite train on the Missouri Pacific system was the “Sunshine Special,” which traveled from St. Louis to the Southwest, with connections all throughout Texas and even reaching to Mexico City. When you ate in the dining car on one of those MP trains, you would find a beautiful charger plate at each place setting. 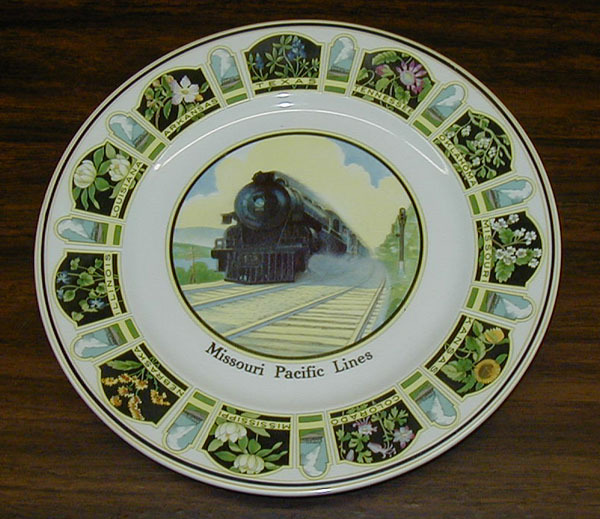 These plates were adorned with a very nice painting of a steam engine in the center, and the state flowers of the states served by MoPac trains, with Missouri’s flower at the top, “12 o’clock,” position. EXCEPT, that is, on dining car service in Texas. When you were eating in the diner on the Texas & Pacific, or on one of the MP trains elsewhere in Texas, there was a different version of the charger plate, with the Texas bluebonnet at the “12 o’clock” position, like the one shown here. 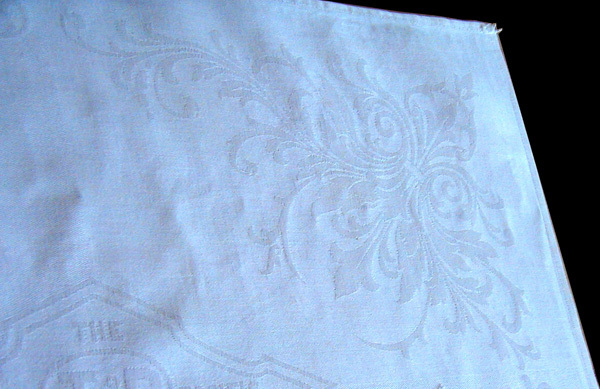 Another favorite piece of mine is this linen damask napkin. 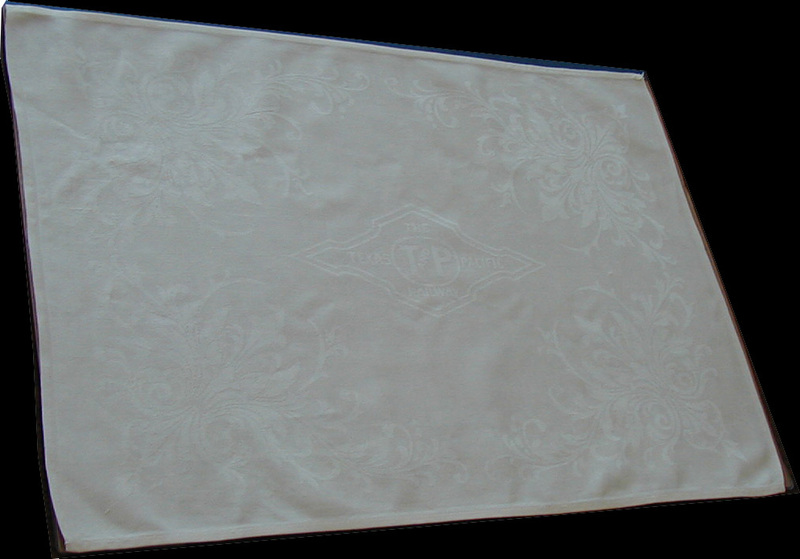 It measures about 15″ x 22″ and has a gorgeous tone-on-tone view of the T&P logo in the center and very ornate corner designs. Imagine sitting down at a table with these at every place, and the heavy Reed & Barton T&P silverware, like this fork, with the T&P logo in the handle. Do you remember when milk came in a little glass bottle instead of the waxed cardboard cartons they use now? 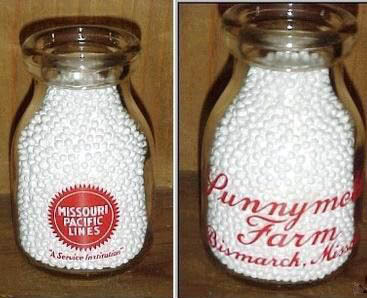 If you ordered milk in the dining car, this is how it came – all the way from Sunnymede Farm of Bismarck, Missouri. Of course, if you were traveling first class in the Pullman car, you might want something a little stronger than milk, especially to help you sleep in the evening. If so, the porter might bring you one of these little bottles of bourbon. It held 1/10th of a pint of 100 proof whiskey – roughly equivalent to the 50mL “shooter” bottles you get nowadays. 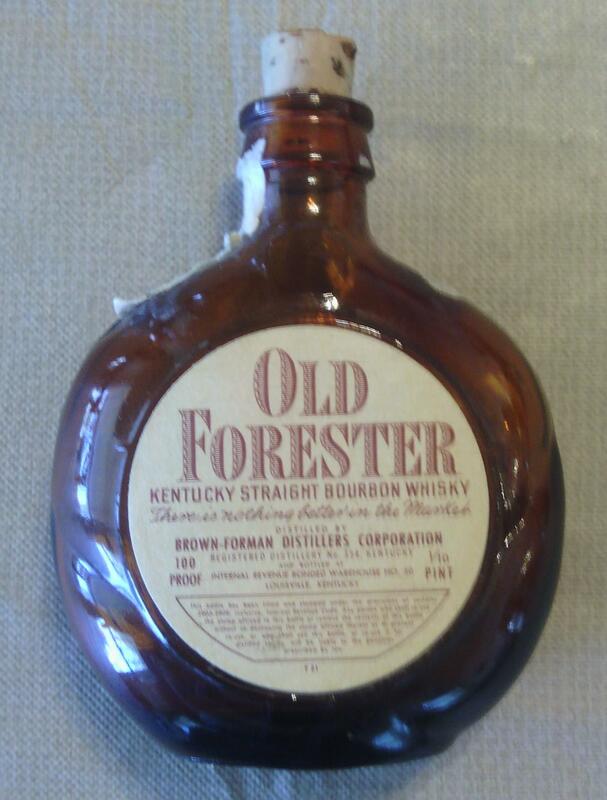 You can still buy Old Forester bourbon today, but I bet it was never finer than when enjoyed to the “rocking of gentle beat” of your private Pullman compartment. 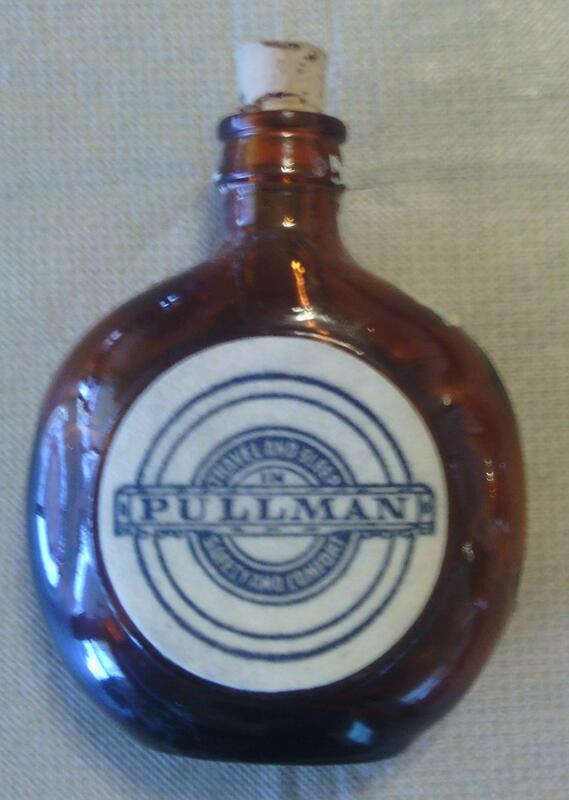 I just love this little brown bottle – it’s about 2 1/2 inches wide by 3 1/2 inches tall. 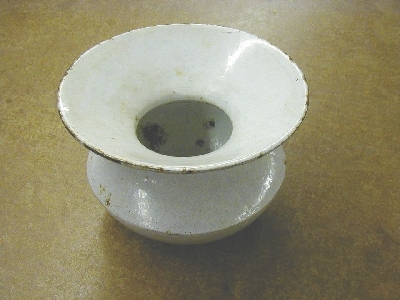 One final piece to show you – it’s a cuspidor – AKA a spittoon – that has been in my family for generations. My grandmother Sallie McMillan gave it to me. Here’s the story as she told it. Her uncle – so that’s my great-GREAT-uncle – was a brakeman for the MP in East Texas. When he retired in the 1920s, as he was leaving the caboose for the last time, he announced, “This railroad has taken a lot from me over the years; now I’m going to take a piece of it!” He reached down and picked up the cuspidor, and headed home. It doesn’t have any markings on it to prove that it came from the RR, or out of a caboose, but that’s the story. Thanks for sharing this look at some of my collection. Any other collectors of RR stuff out there? I’d love to hear from you. When I started doing this, I told myself that I was going to follow the rule of NOT simply re-posting stuff that I found elsewhere. Well, I’ve decided to make that more of a guideline than a rule. “The Train” is a dramatic reading by actor Geoffrey Lewis, performing with the musical and storytelling group, “Celestial Navigations.” I first heard it a few years ago on a local radio station, who had it in their Christmas music mix. I don’t think it’s too well known, but I wanted to share it with you and hope you will enjoy it.